LG brings Livesport.TV to Cinema 3D smart TVs, launches 3D World | What Hi-Fi? LG has teamed up with digital sports media company Perform to bring Livesport.TV to its range of Cinema 3D smart TVs. Livesport.TV includes a range of live and video-on-demand content from a number of leading sports including European and South American football leagues, world snooker, Australian rules football, PSA squash, hockey, tennis, Rugby Union and Rugby League. LG will offer Livesport.TV in five European countries: UK, France, Germany, Spain and Italy. Live sports will be made available via a number of subscription options, while all VOD content can be accessed for free. 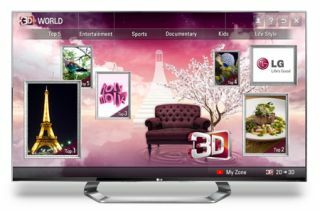 At the same time, LG has announced the global launch of 3D World, bringing owners of LG smart TVs access to an "expansive selection of high-quality 3D content" via a 'card' on the Home dashboard. 3D content will be available in categories such as entertainment, sports, documentary, kids and lifestyle. 3D World will be offered in app format for Cinema 3D TVs produced in 2011, while 2012 models will use the streamlined card system on the Home dashboard.